The CCEL functions as a connector organization that links students, faculty/staff, and community partners. Our center does not place volunteers. Instead, the CCEL provides resources for volunteers to find opportunities that best fit their individual needs. One powerful matchmaking tool we offer is the Community Partner Directory. This comprehensive listing contains information on community partners including their mission, volunteer opportunities, and contact information. Students, faculty and staff can access this database in order to find a fit for their needs; individuals may also visit our office to find a good match. Another aim of the CCEL is to provide opportunities for partners to meet and collaborate independently with faculty. Such an event is the Community Partner Breakfast. The ultimate goal for partners is to find sustainable, mission-aligned partnerships. The CCEL provides methods for partners to engage students that include tabling events, classroom visits, and online calendars. Please work with the CCEL staff to tap into our powerful base. The CCEL partners with non-profits and government agencies to provide service opportunities for faculty, staff and students. We also partner with for-profit agencies who are working on community focused projects. These organizations receive a volunteer pool from WSU as large as it is diverse, thus providing them with a wide range of skills. Partners become co-educators by helping students learn civic values and opportunities to enhance their education. Your Partnership is Important to Us! We could not accomplish so much without your help! It is our goal to ensure that your organization is kept abreast of all opportunities and changes at our center and in the community. 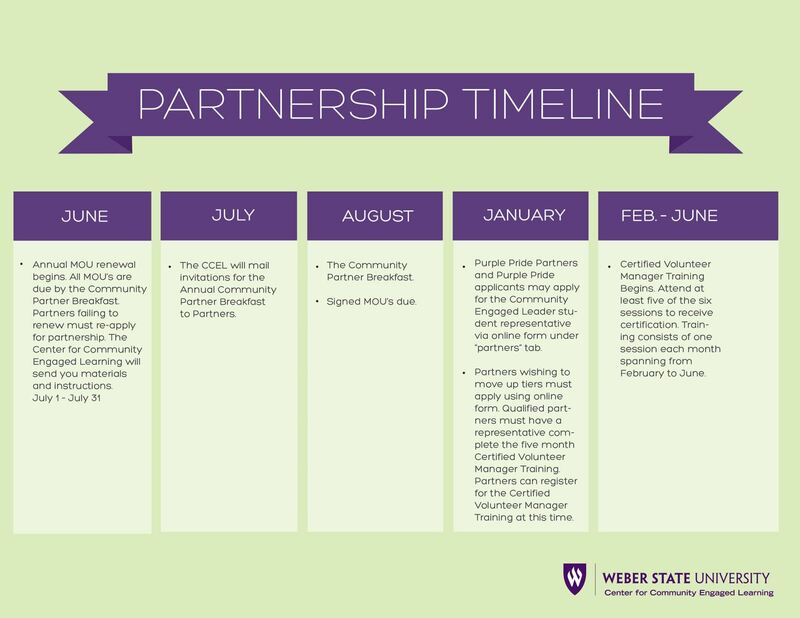 We cannot guarantee volunteers, but we will strive to advertise to and educate as many individuals at Weber State University as possible. If at any time you have questions about your partnership or should you have a special need for volunteers, please do not hesitate to contact our center.